Channel partner training (or reseller training) is an essential action to grow your business. With substantial benefits - higher ROI, stronger brand, faster growth - it’s a winning strategy. But, how do you get started? And what tools do you need to get the best results from your partner training? Throughout this guide, we'll answer the questions you need to know about channel partner training. We outline the benefits, the types of training you can use, and share how a learning management system (LMS) helps you deliver powerfully impactful training. What are channel partner training programs? Channel partner training provides your partners with the tools they need to be successful members of your network. The training typically consists of text, audio, video, webinars, face-to-face training blended learning. It provides product information, sales training, support training, marketing guidance and more. Commonly, courses are combined with surveys to provide feedback on your product and services. Training, involving certification, is often a prerequisite to becoming a partner. In a Corporate University structure, users select the courses they want to take. Learners then become a certified partner/reseller or user of your product. With Partner/Reseller Specific, training is typically restricted. Using an LMS, businesses create dedicated learning portals. The courses are then part of your base reseller offering or even sold as part of an upsell. What are the benefits of training channel partners online? Training builds a stronger, more productive partner network. By investing in product or service training, you’re enabling the success of your partners resulting in them sticking around for longer. You're also nurturing a training community that boosts your partners’ success and enables you to grow faster. Through training, your partners are better educated. They ask fewer product-related questions and are equipped with the resources they need. This means they are less likely to need support and guidance, saving you time, money and resources in the long-term. Onboarding partners takes time, but with effective training you can scale this process. Your partners and resellers are up and running faster, delivering the results you want, more efficiently. Better trained partners are more knowledgeable than your competition. When armed with your core messaging, benefits and value, you're enabling them to sell more. By certifying your partners through training, they will know the product better. They'll learn the ins and outs, the benefits and how to troubleshoot issues. This enables them to sell more and generate more revenue for themselves and your business. Delivered at scale, training provides messaging consistency. Partners have to meet your high standard before becoming an authorized partner. And you're safe in the knowledge they're selling your brand values, vision and product/service correctly. With an LMS, you can sell your certified product training to generate an additional revenue stream. This certified product training is also a value-add service for your partners. Through surveys, ratings and comments, training is an invaluable way to get partner feedback. This feedback can be used to improve your product and make your partner channel stronger. Why use an LMS for an online training partner program? A learning management system (LMS) is a must-have tool for your business if you want to deliver impactful training. Purpose built to make your training simple, yet effective, it has the features you need to get the benefits of channel training. As we mentioned above, certifying your partners proves they've met a specific standard of product knowledge. And with an LMS you can certify your partners with ease. You can automatically award certificates to learners based on rules you establish within your LMS. For example, if they pass an exam or complete a series of courses, they'll get a certificate. Conveniently, certification can be set on a periodic basis. If you want to recertify your partners/ resellers every year or two years, etc., simply set an expiry and re-enrollment date. Your learners are then notified automatically without any further input from you and they'll always be certified as a result. To scale your business, you need a training experience that’s simple and feels right for your partners. This is where multi-portals come in. Each partner can have their own unique eLearning portal, preferred URL, and branding in your LMS. They also can be managed all within one account. This means you can configure the branding, upload logos, and banner images – to create a portal that is recognizable to your partners and are easily managed by you. Single sign-on (SSO) removes a barrier so your training can be accessed and completed with ease. It allows learners to click through to your LMS from an intranet or partner portal, without having to use a second set of login credentials. The easier it is for your partners to access the LMS the higher the chance your courses will be completed. The point of using an LMS for partners is to deliver product training courses to them. The process of creating or uploading courses needs to be quick and easy for you. It also needs to be highly scalable because you may have hundreds or thousands of partners. A great LMS should support SCORM and xAPI courses built using an authoring tool. You can also use existing assets - documents, presentations, videos, etc. - to build out your courses. 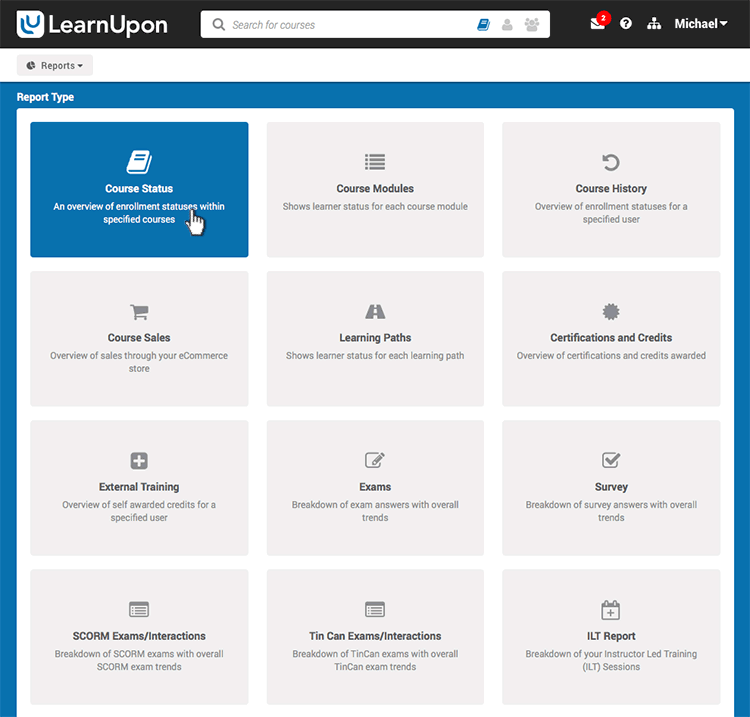 A multi-tenant solution, like LearnUpon, is perfect for partner training. If you have a large number of portals, you can license courses to each portal making it easy to deliver courses to many partner groups – including enrollment limits and availability windows. You can even allow your partners to build their own courses if appropriate. Setting up an eCommerce storefront is a great way to provide partner/reseller training for two reasons. It reduces manual effort as the learner is automatically enrolled once payment has been made, and it provides you with an extra stream of revenue. An LMS with eCommerce features makes it easy to set up fully branded and configured storefronts where resellers can purchase courses, bundles or learning paths. The storefronts integrate with leading payment gateways meaning that the partner can purchase courses securely and be enrolled instantly. The partner can avail of bulk purchasing if they need to purchase courses for large groups of users. You can choose to set up one storefront for all partners or one for each, using a separate portal for each partner. The uptake and completion of training by your partners is an essential metric you need to be able to measure. It allows you to see the time frame it takes each reseller to complete courses, the percentage that pass/fail, and you can use this information to make informed business decisions. An LMS with a robust reporting suite allows you to do this and so much more. You can see which partners are certified and which are due for renewal soon. You can also set up scheduled reports so that the data is sent to the individuals of your choice, daily, weekly or monthly, so they don’t even need to log into the LMS. The real insights come from the ability to link this training information to other business data such as data in your CRM system. If one reseller is not performing as well as others, perhaps they might require different training. For example with a Salesforce integration, you can even combine your CRM and LMS data to gain insight from both – in real time! Training is an excellent way to add value to your business, get partners up to speed with your product or service quickly, and ultimately build a stronger relationship with them. 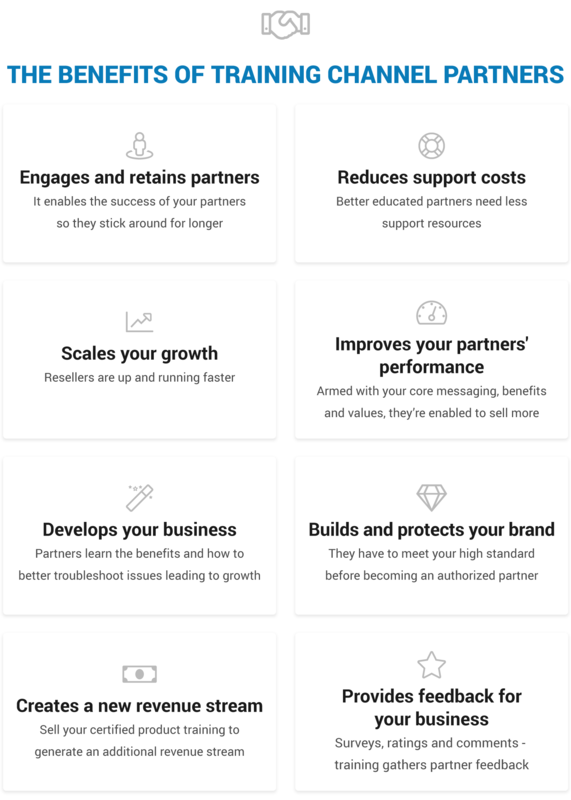 Train your partners with LearnUpon. The powerful learning management system that has the features and knowledgeable team you need to achieve training success.